Bettina Genthe attended the whole meeting via telephone conference. 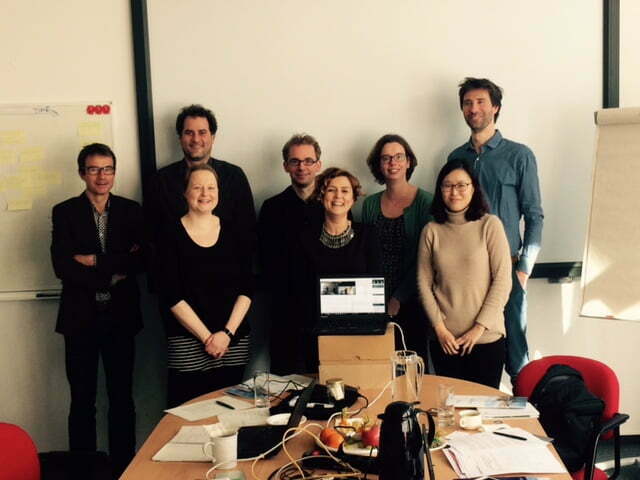 The other eight members in Berlin were Hella Schwarzmuller and Ulf Miehe (both KWB), Evrim Atalas (io Environmental Solutions, Eun-Ju Kim (KIST), Jan Peter van der Hoek (Waternet), Barry Pieters (Waterlaboratorium), and Annemieke Kolkman and Thomas ter Laak (both KWR). After an introduction of KWB and io Environmental Solutions, Thomas ter Laak gave a presentation on Watershare and the ES CoP. In addition, Annemieke Kolkman discussed the outcomes of the questionnaire organized by KWR, in which the network of the Emerging Substances CoP was mapped. The Watershare AbetES tool was discussed in more detail and some good suggestions for its improvement, for example the addition of location-specific data, and the possibilities for its use in projects were explored. There followed a highly interactive session on the expectations of the different ES CoP members. During the discussion it became clear that the biggest challenge for the ES CoP is to define projects and obtain financing to really start working as a Community of Practice. In the afternoon session we elaborated on this issue, including a brainstorm session about the different funding possibilities. Funding will be an item on the agenda of our conference calls intended to keep each other updated. Moreover, we discussed the possibilities of increasing our visibility as a Community of Practice and actively participating in the Amsterdam International Water Week 2017. As follow up, Jan Peter van der Hoek submitted the abstract on the subject “AbatES” as a solution on behalf of the ES CoP to the AIWW.